As World Bank officials prepare to start helping Burma overcome years of financial mess and debt, another organization warned of threats that could still derail the country’s reform process. The threats could not only halt domestic reforms but also re-freeze the thaw in relations between Burma and the West, said the New York-based Asia Society. “There are two potential spoilers in the government: the corrupt remnants of the old order and the government party, the Union Solidarity and Development Party,” said the well-known non-profit educational organization. “The interests of the first group are threatened primarily by economic reforms that could inhibit their opportunities for raking in payments from trade and investment. The second group is likely to see its interests threatened by a resurgent NLD,” the Society said, referring to Burma's leading opposition party, the National League for Democracy. “Both groups could easily find common cause,” it added. But rogue generals are not the only obstacle. The complicated legal web surrounding US sanctions could take years to unravel, the Society warned. The World Bank team heading for Burma will at this stage only advise on restructuring the country’s banking system. This limited involvement is now possible because the United States, a dominant World Bank member, has given its nod of approval. But Washington will not—yet—permit any lending by the World Bank or the International Monetary Fund. Washington and its Western allies have made it clear they will wait until after forthcoming parliamentary by-elections, in which pro-democracy leader Aung San Suu Kyi is participating, before condoning any financial loans or grants. And there is the matter of the tens, if not hundreds, of millions of dollars in loan money still owed by Burma to the international financial institutions going back over 25 years. Burma’s full rehabilitation into the international financial system is for the time being still stymied by US economic sanctions, which include a global block on all transactions with Burma in US dollars. The former British government ambassador to Thailand and Vietnam, Derek Tonkin, last week urged the United States to end its block on Burma using US dollars. “It is indiscriminate in its targeting and impacts the entire economy,” said Tonkin, who is now chairman of the Britain-based NGO Network Myanmar. “It needs to be eased as soon as possible so that aid, trade and investment flows can be facilitated,” he said in a statement on the Network Myanmar website. However, experts at the Center for Strategic and International Studies in Washington think unraveling the “spaghetti bowl” of sanctions imposed since 1988 will be “phenomenally difficult and slow”. In some cases, such as Washington’s lifting of a ban on the World Bank engaging with Burma, change can be made by presidential waiver. But in many other cases it could take years, says a new report by Murray Hiebert, the deputy director of the Center’s Southeast Asia Program, and fellow researcher Tracy Quek. Hiebert and Quek describe the lifting of a bar on the World Bank and the IMF as “very limited” since it lasts only until September this year. “The US Congress will also face a challenge removing sanctions because of the overlapping provisions of the laws and executive orders of the current sanctions regime,” the Hiebert-Quek report said. The US dollar sanction additionally inhibits European Union financial bodies from helping Burma because of their intertwining links with the American currency and the risk of running foul of the US legal system. The task facing the World Bank advisory team is daunting after decades of financial mismanagement and abuse by the military. “As the [Burmese] reformers pursue macroeconomic reforms of the banking, fiscal and currency systems, they are realizing how very difficult it will be to untangle and correct the deeply flawed and corrupt systems that have underpinned the military economy for decades,” said the Asia Society in its own report following a visit to Burma. “Moreover, their early attempts at economic reform are constantly being sabotaged by those who have a vested interest in retaining corrupt practices. What on earth have made you guys changed the tone of your previous comments? Quick economic growth does not come in the blink of an eye. No free lunch. Everything comes with a price and the price in this case is honesty. There is no dilemma here except for good governance with honesty. Return On Capital Employed and profit and capital repartriation are the criteria. Corruption is everywhere, even in the West.Big companies carry suitcases full of dollars to Arabic despostic states.Nothing new.There are always dilemas. Investment is important for ordinary people; the multiplier effect is much needed in Burma now for a fairly quick economic growth.Investment in education and training must not wait. Without the necessary skills, there can be no sustainable growth. Get the economy airborne! Parliament can do little, other than blowing hot air.One-eyed is king amongst the blind. 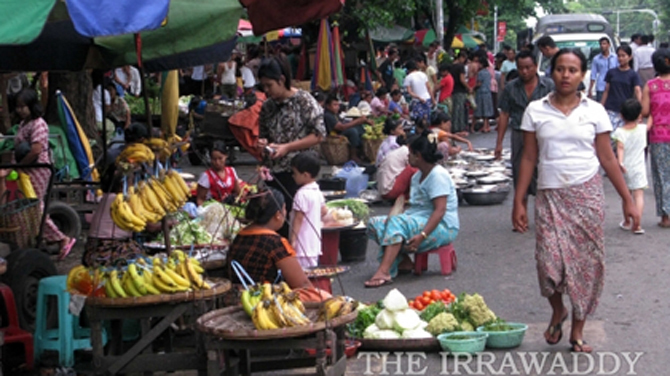 Burma is in dire need of workable strategy. Fat Hope. No honesty no investment money. Return all the land to the farmers in Mingaladon first then let's see about it. That's for sure. Dream on! We will endeavour to persuade the big guys to invest in Burma, rest assured. Correcting systemic corruption is a matter of legislation. Out leader can provide legal construction for the reforms. Everyone wants fairness. No point in hanging on to corrupt system even for the vested interests. ShuMaung's family could not keep the loots. So what make anyone think that those who had the snout in the trough can keep their bounties? One of the interesting things here is that the U.S. Senate Majority leader, Mitch McConnell, has had a great interest in Myanmar, and has visited lately. If he is happy with the state of progress and the elections are free and fair, he would actually move quickly to undo the sanctions, and lead the Republicans in the U.S. Senate to do so, and Obama would likely agree. My suspicion is that the entire web of sanctions will be removed very quickly if the elections are free. Literally within days. "Genius" or "Genuine" reform depends on the present Burmese government honesty. No big guy will throw in money to invest without knowing that there will "genuine" or "genius" investment law, rule of law and genuine stability in the Kyats. No fat hope. Didn’t Asia Society also called for lifting of economic sanctions? I guess it wouldn’t be the first time Irrawaddy left out a piece of information. But anyway, this is exactly what I’ve feared regarding US sanctions on Burma. Everyone who follows American politics is aware of the snail speed of Washington. On top of that, after decades of sour relations, US has put overlapping sanctions by passing intricate legislations on Burma that it would take years to undo. Asia Society also made a good point, which certain Burma observers do not get, that the economic sanctions are actually hurting the ordinary Burmese people while entrenching the business elite who are most likely intertwined with hardliners in the government. I sincerely hope that Burma continues on the path of reforms and achieves genuine democracy but if it does, it won’t be because of Washington but rather in spite of it. You can say that again. And it won't be rectified any time soon since the regime has a limited ruling class interest and only a selective intellectual input to serve the purpose remains acceptable. Their requirement is not complicated. Dear Mr Derek Tonkin, please do not be naive. Those who have vested interests in keeping to their corrupt practices have already put in place systems that will enable them to continue with their corrupt practices. These same rogue generals are in control of every corner of parliament and government and the financial systems. There is an old saying in the country - To be clean of corruption, the whole government has to be cleaned out from the start and this might take at least a whole or 2 generations if not decades to do so. A leopard can not change its spot and the same military people are still in control threatening any kind of reforms.